​We provide a household bucket for your convenience. You do the collection and leave it at curbside for us once a week. Regardless of the number of dogs! ​$20.98 per litter pan - includes disposal! We clean up and dispose of the "presents" your pet deposits in your yard. We also offer a weekly disposal service to take away kitty litter, dog droppings and litter from small caged pets! When geese leave their "calling cards" we can remove those droppings from your yard too - call us for a quote! 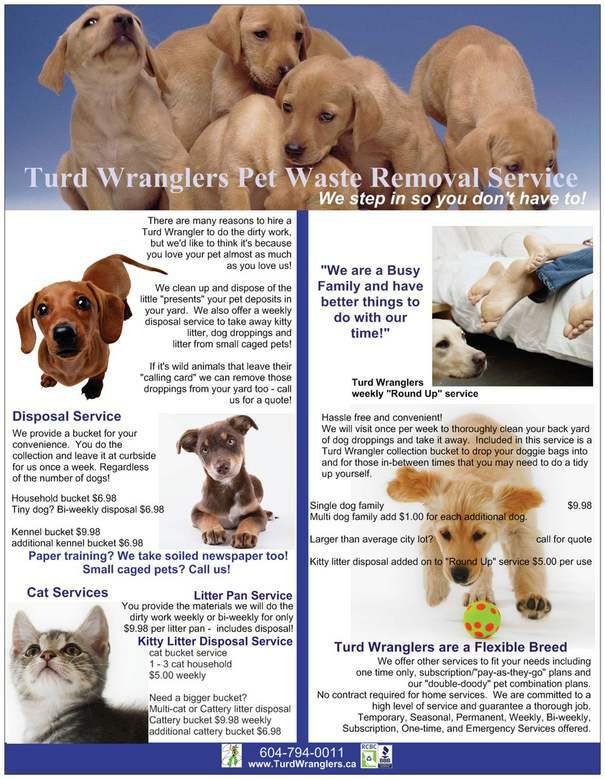 ​There are many reasons to hire a Turd Wrangler to do the dirty work, we'd like to think it's because you love us almost as much as you love your pet! ​Hassle free and convenient! We will visit once per week to thoroughly clean your back yard of dog droppings and take it away. Included in this service is a Turd Wrangler collection bucket to drop your dog's walk bags into and for those in-between times that you may need to do a tidy up yourself. Larger than average city lot? A little distance out of our regular service route or excess volume of waste? Our Wrangler will let you know if we will have to charge more than our basic rates. Complete details and information will be sent to you prior to services beginning in our welcome e-mail to you. ​We offer other services to fit your needs including one time only, subscription/equal payment plans, prepaid "lump sum" plans and our "double doody" pet combination plans. No contract required for home services. We are committed to a high level of service and guarantee a thorough job. Temporary, Seasonal, Permanent, Weekly, Bi-weekly, Subscription, One-time and Emergency Services offered.